SPEECH AND LANGUAGE PATHOLOGISTS VIDEO: Did you know that May is Better Speech and Hearing Awareness Month? May provides Speech-Language Pathologists (SLP) and audiologists an opportunity to raise awareness about communication disorders and their roles. Click below to watch your school’s SLP sing and dance to their own unique version of Pharrell’s “Happy.” Stay tuned to @EnglishMTL throughout May for daily Speech and Language tips. We also encourage you to visit the EMSB website and Center of Excellence for Speech and Language website for more information. And we encourage you to contact your school’s SLP for more information about Speech and Hearing Awareness Month and keep an eye out for the SLP ad in the spring edition of Inspirations! The video includes cameo appearances by EMSB Director General Robert Stocker and Director of Student Services Lew Lewis. The stars are SLPs Kirsten Blazina, Elizabeth Christe, Beatrice Devroye, Pam Goldsmith, Carol Jazzar, Beth Jeronimo, Anna Kij, Raluca Oanea, Susan Waite and Trish Watts. Congratulations to EMSB Digital Marketing Officer Daniel Smajovits, who spent days filming and then editing the final product. CHILD MENTAL HEALTH AWARENESS WEEK: Is your school ready? Child Mental Health Awareness Week is coming May 4 to 8 and this is the time to get students involved! This year’s theme is “It Takes A Village…” – our connections with others. Being connected is a protective factor! Be part of the movement and plan activities that highlight mental health awareness and prevention. Details will follow in emails sent to principals. For more information contact Despina Vassiliou at the EMSB Mental Health Resource Centre at dvassiliou@emsb.qc.ca. SCHOLASTIC WINNER: Fourteen-year old Noora Jane Khan of LaurenHill Academy’s Junior Campus in St. Laurent is this year’s Quebec Provincial Champion of the “Scholastic Challenge” contest. The Scholastic Challenge is a Canada-wide contest for Grade 8 students designed as an enrichment activity to stimulate students’ interest in knowledge, thinking and learning, and to offer a challenge to top-achieving students. The contest has been offered nation-wide since 1998. The test consists of 100 on-line questions, and lasts one hour. The six categories covered in the test are: general knowledge (food, art, sports, music, current events, entertainment, mythology, etc. ), language and literature, history, geography, science and math. LaurenHill invites 30 of its top-achieving Grade 8 students to participate in this contest each year. Noora is an honour-roll student in LaurenHill Academy’s French immersion stream. She is also in the enriched math program. Prior to attending LaurenHill, she was a student at Cedarcrest Elementary School. When asked about her future goals, she stated, “I hope to study chemistry in university, and I would love to pursue a career in cancer research later on.” See full press release. HEALTH FORUM: The EMSB, the Quebec Council on Tobacco and Health, the Youth Coalition Against Smoking and la Direction de santé publique de l’Agence de la santé et des services sociaux de Montréal (DSP), will co-present an important youth forum on Wednesday, April 29 about smoking. It will take place at St. Pius X Career Centre (9955 Papineau Street North) in Ahuntsic from 8:30 a.m. to 1 pm. and include the presence of Grade 10 students from EMSB high schools. The Forum will provide participating students an opportunity to interact with their peers who share the same health awareness concerns. Students will be involved in small-group activities, as well as plenary sessions designed to help student participants give voice to their concerns about this issue, and to find creative ways to address it both on-site, and afterward, in their own schools. The students will be asked to use their creative energies to get the message out to the Minister of Health. Student representatives, along with the Spiritual Community Animator for their school, will be asked to facilitate participation in a post-forum lunch-hour activity featuring a “Q&A” card challenge. ENERGY SAVINGS: EMSB elementary and high schools are marking the week of Earth Day (April 20 to 24) in many different ways, including those taking part in special programming related to energy efficiency. The hour-long program on energy efficiency is being organized by Jour de la Terre Québec and Énergère, a leading Quebec-based energy service company. This is geared towards students in grades 5 to 7 and will show them through a lively power point presentation and several interactive demonstrations, what energy is all about, as well as the different ways of practicing energy efficiency. The participating schools are: John F. Kennedy High School in St. Michel; Michelangelo International in Riviere des Prairies; Roslyn School in Westmount; Dante School in St. Leonard; and Rosemount High School. See press release. THE PROJECT: A reminder that 17 EMSB schools and centres are taking part in a $24.6 million major initiative aimed at bolstering energy efficiency in school buildings. This new project with Énergère, which was officially announced last month, includes, among other measures, equipment renewal and modernization using aerothermal technology, replacing 25,300 lights and the addition of automated controls to enhance the comfort of staff and students. Once the project is completed, the 17 buildings will achieve a 53 percent reduction in energy consumption and 74 percent reduction in greenhouse gas emissions per year. POSTER CONTEST: Eight EMSB elementary schools have been invited to participate in a contest sponsored by the EMSB and Énergère to help promote and raise awareness of energy efficiency and saving the planet. Each participating school will receive a drawing of a tree on an eight by eight foot piece of coroplast poster board. Students have to cut out a leaf or petal from a piece of paper, write their own idea on it regarding how to save the planet, and then paste the leaf or petal on the picture, which would create a unique-looking landscape. Prizes will be awarded for the best ideas and the winning landscape picture will go on display at the EMSB head office. The eight elementary schools that have been invited to participate in this contest, and are also part of the energy efficiency project, are Pierre Elliott Trudeau School in Rosemount; St. Gabriel School in Pointe St. Charles; Roslyn School in Westmount; Gerald McShane School in Montreal North; Dante School in St. Leonard; and East Hill School, Leonardo Da Vinci Academy and Michelangelo International in RDP. Participants gather at the start of the Spirit Quest. SPIRIT QUEST: On Wednesday, April 22 students and spiritual and community animators (SCA) from the EMSB took part in an event modelled around television’s Amazing Race, but aimed at visiting sacred spiritual sites and experiencing compassion in action in order to further develop their spiritual awareness. There were number of links to Earth Day, including a tree planting and a celebration of First Nations’ traditions of caring for the earth and for one another, at the launching of the event. The first ever EMSB-SCA Spirit Quest involved six schools: Lester B. Pearson High School in Montreal North, Vincent Massey Collegiate in Rosemount, Rosemount High School, John F. Kennedy High School in St. Michel and Marymount Academy International and Royal Vale High School in NDG. Teams commenced their day-long journey at the EMSB Central Head Office at 6000 Fielding Avenue in NDG at 8 a.m. and concluded around 3:30 p.m. at Vincent Massey Collegiate. Students were tasked with completing a photo challenge, gathering information and be coming inspired to give back to their own community. Actions included honouring Canadian Veterans and fallen soldiers at one of the locations, visiting sacred sites and learning about the history of Montreal. One of the goals of the SCA service is to facilitate and encourage students to put into action their best self, and express their own positive virtues and character traits. This is the “Virtues Program” delivered by the SCA service that is the foundation of the EMSB/SCA Spirit Quest, representing a journey to deeper self-understanding. Each team consisted of a maximum of six students aged 12 to 16 and one SCA. They navigated a series of clues to get from one location to another by walking or using eco-friendly public transit, encountering route markers, road blocks and detours. The Spirit Quest allows students to visit civic, historic, and spiritual and community organization sites while obtaining personal experience in developing positive virtues and character traits, strengthening the bonds of school-community relations as well as their intimate connection to the earth and their own spirit. Spirit Quest was sponsored by Yeh! Frozen Yogurt and Café (www.yehyogurt.com), The Beat 92.5 FM, Rosemount Techology Centre, RDP Centre du Pavé et Jardin, the Canadian Forces, Knights of Columbus, DiLetta Laesina D’Argenio, Eliot Perrin, Muffin Plus, City Councillor Craig Sauve, Francesco Marra and the Montreal Police Department. The Miss Earth personalities and four admiring students. VISIT BY MISS EARTH: On the occasion of Earth Day, Carlyle International School in Town of Mount Royal welcomed five special guests on April 22. Miss Earth Canada National Director Ronaldo Soriano Trono was accompanied by Miss Earth Quebec winners for 2013 and 2014 respectively, Elizabeth Ojeil and Marie Antonette Carbon, as well as candidates Sarah Donia Cherif and Maria Jose Acosta. Miss Earth Canada is an annual competition in which the winner must show her commitment to environmental awareness and the preservation of the planet. They are given the opportunity to highlight these goals through events locally and internationally. See the beautiful song students sang in French especially for Earth Day. ECOMUSEUM VISIT: During the pedagogical day on April 20, the EMSB BASE Day Care students at Carlyle went to the Ecomuseum Zoo, a zoological park, in Sainte-Anne-de-Bellevue. The students became zookeepers for the day! They had an unbelievable time observing, preparing the food, feeding and touching some of the animals. They are the one and only outdoor zoo on the island of Montreal, with over 115 animal species from Quebec in a cozy and natural setting. Everyone should take the time to visit the museum, which is open 364 days per year! ANGELIKE FALBO: The EMSB is extremely proud of Laurier Macdonald High School Secondary V student Angelike Falbo. She made it to the finals of the popular TVA French language television show La Voix (The Voice), viewed by more than 2.5 million people each week. Angelike has attended the EMSB since she entered the public education system, first at the former Frederick Banting Elementary School/Gerald McShane in Montreal North, then John Paul Junior High School in St. Léonard and now Laurier Macdonald. Her father, Joe Falbo, is an Italian Canadian; her mother, Manon Ledoux, is a francophone. 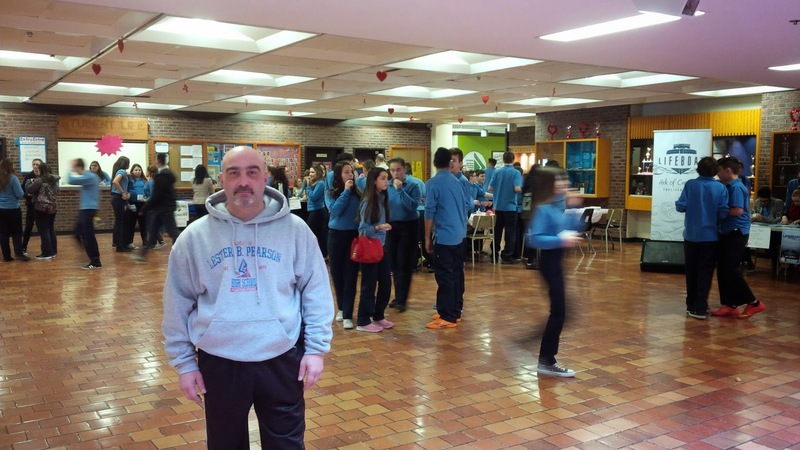 Mr. Falbo says he credits the EMSB`s excellent instruction of the French language for Angelike`s bilingualism. Her impeccable command of French is being showcased regularly during interviews on stage and of course through song. Here is Angelike`s exclusive interview with EMSB TV. Angelike meets Vice Chair Sylvia Lo Bianco and Chair Angela Mancini. Meanwhile, one of the other top four finishers was Rosa Laricchiuta. She previously attended Gerald McShane Elementary School, Leonardo Da Vinci Academy, Sir Wilfred Laurier Junior High School and Lester B. Pearson High School in Montreal North. She intends on visiting some of her former schools in the coming weeks. Commissioner Julien Feldman, Chair Angela Mancini, Principal Jim Daskalakis, DG Robert Stocker and Mona Vaudry. VOLUNTEER APPRECIATION EVENING: The EMSB held its annual Volunteer Appreciation Evening on April 14 at the Plaza Volare of the Crowne Plaza Hotel in St. Laurent. This year’s event was being held to commemorate National Volunteer Week, which ran from April 12 to 18, under the theme of “Making A Difference.” Angelike Falbo performed as did Montreal comedian – and Vice Principal of the Galileo Adult Education Centre in Montreal North – Joe Cacchione. Time and space do not allow the EMSB to honour all of its nearly 1,500 volunteers in person. Therefore, only those individuals who have volunteered for more than five years attended. The emcees for the evening were Global News senior anchor Jamie Orchard and EMSB Communications and Marketing Specialist Michael Cohen. This year’s Volunteer of Distinction was Mona Vaudry from St. Gabriel Elementary School in Pointe St. Charles. A volunteer with St. Gabriel for 35 years, Ms. Vaudry, who lives only 10 minutes from the school, volunteers there every day from 6:50 a.m. to 2:30 p.m., and does everything from decorating the school for special events, to preparing snacks for the students, to being involved with the school’s lunch program and the Home and School Committee. Here is our photo album of Angelike Falbo's visit. Musical entertainment was provided by Ultimate Destinie, a Montreal-based multi-cultural band For the seventh consecutive year, La Capitale Financial Services (www.lacapitale.com) was the title sponsor for this event. See the press release for the list of other sponsors. Benny Berneti is a true presence at Lester B. Pearson High. LESTER B STALWART: Benny Berneti, an outstanding volunteer for Lester B. Pearson High School, received a Volunteer Award from Member of Parliament Massimo Pacetti's office. At a Governing Board meeting, everyone toasted Benny with sparkling wine and canoli. DAVID MARINO IN CONCERT: David Marino, a Secondary V student at Vincent Massey Collegiate in Rosemount, continues to excel in his singing career while expressing his huge love for jazz music. Over the last few years he has had the pleasure of working with great jazz musicians and directors who have taught him about the great jazz composers, lyricists, and singers of all time. He is now planning for his own show on Monday, May 18 (7 pm) at the Leonardo Da Vinci Center in St. Léonard (Victoria Day). “On February 14, I held my first concert and I can definitely say, it was the jazziest and best night of my life,” he says. “I was very happy that my first show sold out!” Here is the flyer. DAYCARE WEEK: The Before and After School Enriched (B.A.S.E.) Daycare Program will be celebrating Daycare Week from May 11 to 15. This year’s theme is: "Always Shining Bright." To honour this theme, B.A.S.E. Daycare Services will celebrate each of its six educational cores at the EMSB and at selected schools. Students will be shining brightly each day of the week showcasing projects and performances that they have been working on throughout the year. Here is the schedule. AUTISM AWARENESS MONTH: In recognition of Autism Awareness Month, Edward Murphy Elementary School in Hochelaga-Maisonneuve, students, staff, and parents walked recently to spread autism awareness and support their classmates who have autism. Students at Edward Murphy have been learning a great deal about autism over the last few weeks. Located in the north end of Montreal, Edward Murphy has two specialized classes for students with autism. Guided by principal Franca Cristiano, staff provide students with every opportunity to learn about one another and play together. They integrate students with autism into mainstream classes, and see tremendous progress. In preparation for Autism Awareness Month, Tania Piperni, Autism Spectrum Disorders Consultant at the EMSB presented workshops about autism to each cycle, giving students the opportunity to ask questions about autism and better understand it. Stephanie Napolitano and Pamela D’Adamo teach the school’s two specialized classes for students with autism, and organized the autism awareness walk, which all students, teachers, and some parents participated in. Meanwhile, the staff at Carlyle Elementary School (above) all wore blue to work on April 2 to mark Autism Awareness Day. They were responding to an invitation from their colleagues at Giant Steps School. TRANSGENDER-GENDER NON-CONFORMING CHILDREN: The Student Services Department of the EMSB organized a workshop on the subject of “Transgender/Gender Non-conforming Children” on April 2 for guidance counsellors and spiritual community animators. Guest speakers were Kimberly Manning, Associate Professor of Political Science at Concordia University and Akiko Asano, co-founder and president of Gender Creative Kids Canada. Both animators are parents of a transgender child. ROSSI EXCELS IN GYMNASTICS: Ten year old Vanessa Rossi is a student at Pierre de Coubertin Elementary School in St. Léonard. While maintaining a 90 percent average in Grade 5, she also excels in artistic gymnastics at the competitive level. Vanessa trains for 17 hours per week at Club de Gymnastique Laval Excellence. Having started gymnastics at age four, she then entered the competitive field at age five. On March 29, competing at the Finale Coupe Québec provincial qualifications competition, Vanessa earned a silver medal for her beam routine and finished 10th place overall. This allowed her to qualify for the provincial finals, Les Championnats Québécois, which were held in Chicoutimi from April 17 to 19 where she earned a bronze medal for her floor routine and a bronze medal for her overall total. This placed her third in Quebec in her category, Tyro P2. IMPACT NIGHT: For the 10th year in a row, the EMSB is pleased to announce the continuation of a partnership with the Montreal Impact soccer team through its “All the Way with the Impact” program. Over the next few months, members of the Impact will be visiting elementary and high schools to remind young students of the importance of studying, persevering and building self-confidence in order to succeed. It is now time for our traditional “EMSB Night,” which will take place on Wednesday, May 6 (7:30 pm) at Saputo Stadium against Toronto. More than 2,000 tickets have been sold to the EMSB family alone. This is part of the Amway Canadian Championship, which involves the top five professional clubs in Canada, in the race to qualify for the CONCACAF Champions League. That is an international competition between professional clubs from North America, Central America and the Caribbean. Two students will win $500 Tony Licursi Scholarships. Click here for the video from last year’s game. Evan Bush and some students. VISIT TO PEARSON: The successful EMSB-Impact stay-in-school program called All the Way with the Impact (Jusqu'au Bout avec l'Impact) continues for a 10th consecutive year, designed to promote the importance of persevering in school. The official launch took place on March 31 at Lester B. Pearson High School in Montreal North. Lester B. Pearson High School, home to the only Sport-Études program at the EMSB, also has a partnership with the Montreal Impact Academy. Currently, nine students from the Sport-Études program play for the Impact Academy. Special guests for the launch included both members of the Montreal Impact and the Academy: starting goalkeeper Evan Bush, midfielder, Lester B. Pearson High School student and Academy member Tristano Fasulo, as well as former Impact player and current head coach of the U18 Academy team, Jason Di Tullio. Jessica gets a warm welcome at Honoré-Mercier. WEATHER FORECAST CONTEST: Global Montreal has been looking for junior weather specialists to join Jessica Laventure for live weather segments on the Morning News. Children between the ages of eight and 13 were able to make homemade weather videos and send them to Global. The first winner was Owen Bruemmer, a student at Edinburgh Elementary School in Montreal West. Here is his report. Jessica has visited a number of schools to talk about the contest, including Roslyn in Westmount and Honoré-Mercier in St. Léonard. SCIENCE FAIR: The annual Hydro-Québec Montreal Regional Science & Technology Fair took place recently on the downtown campus of Concordia University. Organized by Educational Alliance for Science & Technology (EAST), this was the first of three consecutive years that the Fair will be hosted at Concordia. During this one-of-a-kind competition, budding scientists aged 13 to 20 presented to visitor’s scientific projects that bring out passion in them, proving that science and technology can be interesting and accessible. The EMSB was represented by 13 projects from six schools (John Paul I Junior High School and Laurier Macdonald High School in St. Léonard, Marymount Academy International in NDG, Royal West Academy in Montreal West, Vincent Massey Collegiate in Rosemount and MIND High School in the Plateau). Two EMSB students, Niraj Dayanandan from Royal West Academy in Montreal West and Fatemen Ghiasi from MIND High School in the Plateau, proceeded to the 2015 Super Expo-sciences Hydro Québec Provincial Finals April 16 to 19 in Gatineau. They were among 15 finalists chosen by judges from the Regional Fair. Niraj’s project was on Slimy Intelligence. He won the Concordia University Department of Biology Award, a gold medal in the junior category and recognition of highest distinction. Fateman, whose project was on metal contamination in rice, captured a bronze medal in the senior caregory, a Université de Laval scholarship, a McGill University Department of Food Science and Agricultural Chemistry prize and was also recognized with highest distinction honours and EAST has been selected by Youth Science Canada to act as hosts of the 2016 Canada Wide Science Festival May 14 to 21 which will attract the country’s top 500 young scientists selected from the almost 500,000 science fair participants across Canada. They will showcase their projects and compete for close to $1,000,000 in cash, prizes and scholarships. ELEMENTARY SCIENCE FAIR: The annual Hydro-Québec Montreal Regional Science & Technology Fair for elementary schools took place March 27 and 28 at Complexe Desjardins. It attracted a total of 59 projects, 35 of which were from the EMSB and six were prize winners. Honoré Mercier received three awards, with one each going to General Vanier, Royal Vale and Dunrae Gardens. Matteo Arduini from Honoré-Mercier Elementary School in St. Léonard took home the Bronze medal overall juvenile. Matteo (Grade 6) was the overall gold medalist last year. His project was entitled: La Bio-Ingénierie de Reins. Honoré Mercier also won two other top prizes. The Prix du Ministère des transports du Québec went to Jordan Iasenza Grade 6- Project Un carburant de l'avenir? He won $250. 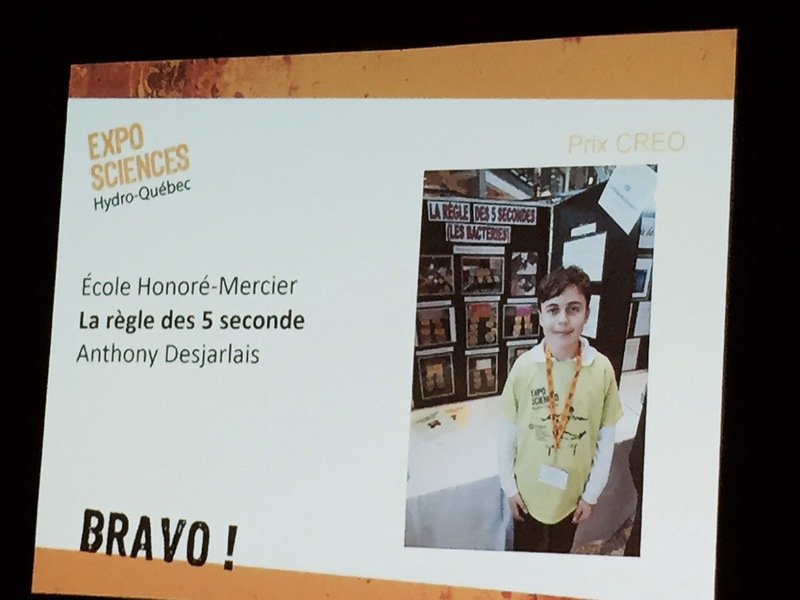 The Prix CREO went to Anthony Desjarlais, also from Grade 6, for La règle des 5 seconds. All of the students presented their projects in French. Principal Darlene Kehyayan and her team. 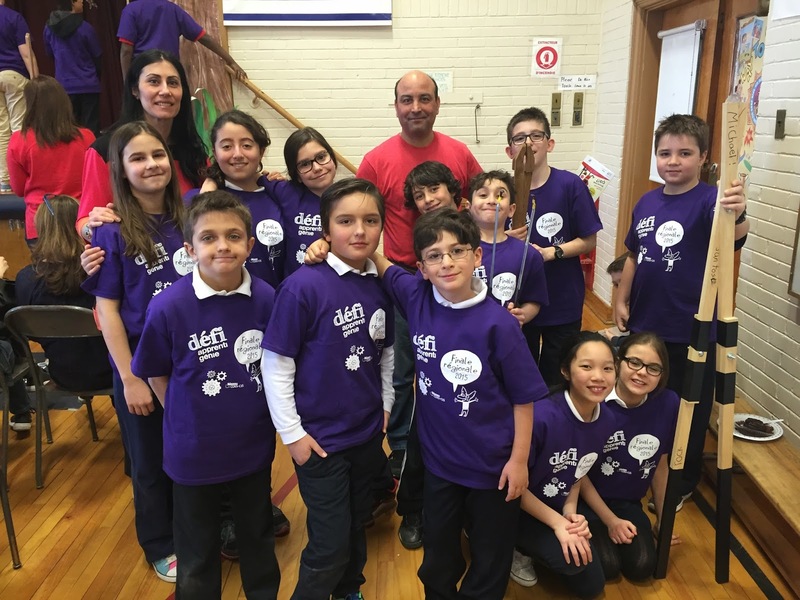 DEFI APPRENTI GÉNIE: The EMSB hosted the Défi Apprenti Génie 2015 event at Dunrae Gardens Elementary School in Town of Mount Royal on April 17. Nine schools, including host Dunrae Gardens competed. The others were all from the French system: École Père-Vimont, École Charles-Perrault, École Pierre Elliott Trudeau, École Du Pélican, École Piché-Dufrost, École Le Sentier, École Catherine-Soumillard and École Paul-Jarry This year, the students designed a technological tool, a forcep, to be able to pick up different weighted objects. It represents a fascinating challenge for students to use their logic and experiment by considering which materials and designs would best serve the accomplishment of this grand task. On this special day, the students will have opportunities to interact and share dialogue with other students from the metropolitan area and share their ideas. With the encouragement and support of each school, all students will learn to develop tools and technologies for the future. “We are pleased to encourage these students in their scientific journey in the process of active inquiry and wish them much success,” said Dunrae Gardens Principal Darlene Kehyayan. MULTI-FAITH ASSEMBLY: Over the past four months, students at Dunrae Gardens have taken a leap of faith – into all faiths – courtesy of Spiritual and Community Animator Puynung Choy. Since January, students had the opportunity to learn about the major world religions, hearing from spiritual leaders representing a variety of belief systems from throughout the world. The unit wrapped up recently when students from Grades 4 through 6 engaged in a multi-faith assembly with guest speakers: Buddhist Daryl Lynn Ross from True North Insight Centre, Minister David Clinker from the Town of Mount Royal United Church, and Imam Salam Elmenyawi from the Montreal Muslim Council. Pedagogical Consultant Paul Kettner in his role of judge with some of the winners. 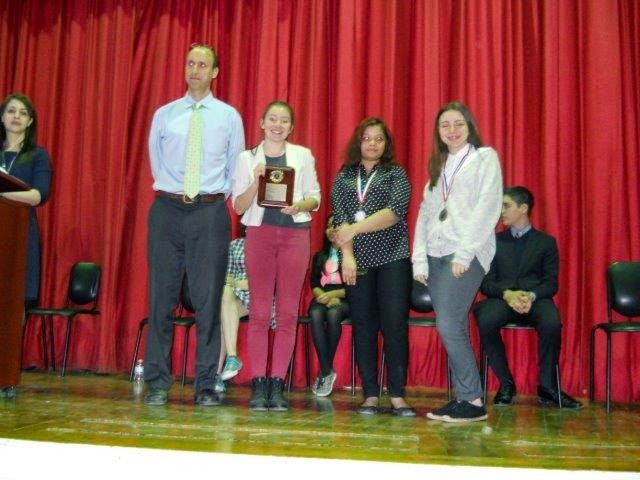 PUBLIC SPEAKING: The 2015 English Montreal School Board annual board-wide Public Speaking Competition for secondary students took place on April 17 at Rosemount High School. As in the past, the Rotary Club of Montreal invited the Secondary V winner to participate at their competition in May. In addition, the Women’s Canadian Club awarded the Secondary IV winner with an all-expenses paid week to Encounters with Canada in Ottawa. In-school finals to select their representatives took place in March and early April. The required form for the Secondary I and II students was a narrative-based text that is a personal story such as an account of family life or an autobiographical incident. Students from Secondary III, IV and V delivered persuasive speeches on issues of social and global significance Donna D'Amato, the new English Language Arts consultant at the EMSB, coordinated the event. See our photo album of the winners. CAREER EXPO: The EMSB`s Adult Education and Vocational Services (AEVS) Department hosted some 1,800 Secondary IV (Grade 10) students for a two day career exploration program on April 9 and 10, at the St. Pius X Career Centre in Ahuntsic. They were exposed to a wide variety of career opportunities in classroom settings. Global TV, City Montreal`s Breakfast TV, The Montreal Gazette, CTV and 92.5 The Beat FM sent representatives to facilitate some excellent media sessions. See the live coverage from Breakfast TV`s Wilder Weir---- http://www.btmontreal.ca/videos/4162729705001. Other disciplines covered included accounting, cooking, auto mechanics, hairdressing, pharmacy, cabinetmaking and furniture finishing, interior decorating, starting a business, welding, firefighting, computer drafting and much more. See our photo album, which includes a great Breakfast TV selfie including co-host and former Canadian Olympic diver Alexandre Despatie. Eddy Nolan takes his latest run. 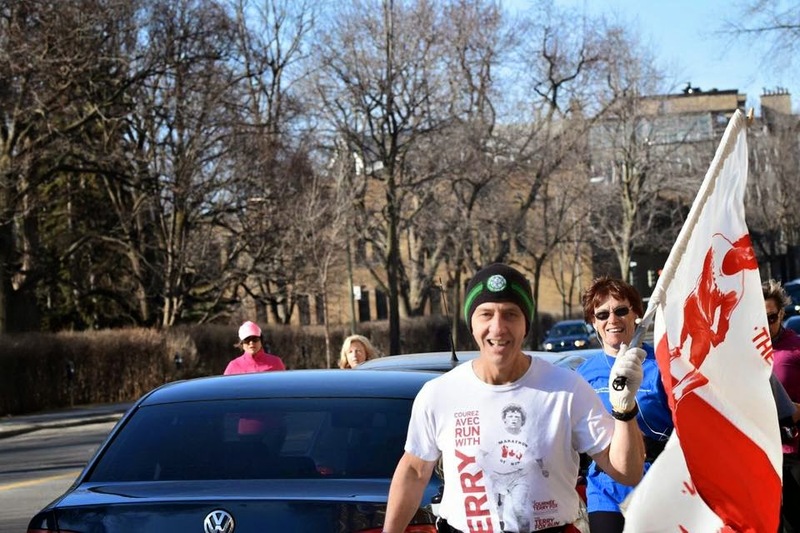 TERRY FOX: Eddy Nolan, presently the caretaker at Mountainview Alternative High School in Côte Saint-Luc, has been running Terry Fox marathons for more than three decades to raise money for cancer research – a disease he has sadly had to battle himself in recent years. Cancer has already taken two of his sisters. On April 12 -- Terry Fox Day – Nolan ran again and made sure there were others doing the same across the country. “This year being the 35th anniversary of the Terry Fox Run, all of the Running Rooms across Canada decided to get involved,” he said. DIGITAL CITIZENSHIP: The EMSB Pedagogical Services Department has launched a new Digital Citizenship initiative. Over two consecutive Board-wide Ped Days in March, elementary and secondary teachers and administrators were treated to insightful presentations from keynote speaker Dr. Alec Couros. On the first day, 700 secondary teachers were on hand followed by 900 from the primary level the following day. Dr. Couros is a professor of educational technology and media in the Faculty of Education at the University of Regina. He works with pre-service and practicing teachers to help them develop the skills needed to become and remain innovative, connected educators. He has facilitated hundreds of presentations worldwide on the topics of educational tech integration, digital citizenship, connected learning, and digital identity. During his presentation Dr. Couros interacted with the audience and live tweeted. You can review all of the Ped Day tweets at #emsbdc. “Digital Citizenship is a concept that continues to evolve,” stated Assistant Director of Pedagogical Services Athina Galanogeorgos. CLEAN UP THE GROUNDS: Despite the wet weather outside, the Edward Murphy Elementary School community of 240 students, staff, parents, as well as two wonderful volunteers from local Eco Quarter, came together recently to clean up their school grounds, both inside and out. Led by Spiritual Community Animator Rocco Speranza, students, sporting their lovely “On se ramasse tous ensemble” t-shirts, collected recyclable materials as well as raked leaves and branches for composting that were left on school grounds from the fall. Students continued indoors as well, ensuring that the school looked spotless. “It is very important to care for our outside environment, but keeping our indoor space clean and helping our caretakers is also important,” said Mr. Speranza. Students were provided a healthy snack thanks to local Maxi Versailles. Clean up activities like this one take place regularly at Edward Murphy School as part of the Spiritual and Community Animator green program and activities. VIVA! SISTEMA: Thirty-two students from the extraordinary after school program at St. Gabriel Elementary School in Pointe St. Charles called Viva! Sistema celebrated three transformative years of musical achievement, as they joined up with 110 musicians from two North American orchestras -- the University of North Carolina Chamber Orchestra and Fine Arts Core Education (FACE) Symphony Orchestra -- for the "Unidos por la música" concert. It took place on Saturday, March 28 at the St. Charles' Church in Pointe St. Charles, which attracted over 300 people. A nice group shot of the key players at the concert. Under the direction of guest conductor Jonathan Andrew Govias, the concert was a dazzling evening that featured a program of Latin American symphonic numbers by composers from that region, as well as musical selections from Georges Bizet’s classic opera “Carmen.” There were also violin solos that were performed by young FACE violin virtuosos Yu Kai Sun, Richard Zheng and Robert Margaryan. The 32 students from St. Gabriel’s Viva! Sistema program appeared during the second half of the concert, where they performed two numbers for strings by Bach and Strachan, as well in the final number of the evening, in which they performed alongside both orchestras. Also present that evening were representatives from the consulates of Venezuela and Mexico. The concert commemorated the 40th anniversary of the inception of the renowned El Sistema world movement in Caracas, as well as the 40th anniversary of the inception of the FACE program in Montreal. Now in its third year, Viva! Sistema is an El Sistema inspired and guided program that uses musical group instruction as a means to affect social change in children and youth. The program runs two hours a day, four days a week and is offered free to the participants. Proceeds from the concert will benefit the Viva! Sistema program at St. Gabriel School. To learn more log on to www.viasistema.org or contact Theodora Stathopoulos, director of the Viva! Sistema Program at info@vivasistema.org. See the photo album. 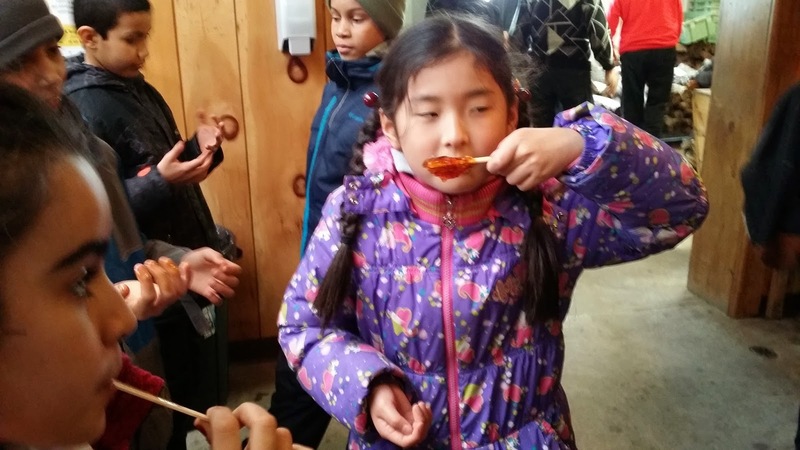 CABANE À SUCRE: The students and teachers at Westmount Park Elementary School were treated to a wonderful Quebec tradition – sugaring off. The entire school visited Cabane à Sucre LaBranche over the course of three days. For many of our students this was the first time that they tasted maple syrup. It was love at first bite! The day was filled with lots of exciting new experiences: the children rode in a horse-drawn wagon through the maple groves. Their driver told them all about how maples are tapped for their sap. They also visited a miniature farm where they were hard-pressed to choose their favourite creature. Among the front-runners were the peacock, feisty goats, shy little lambs, and curious calf. From there, it was off to the kitchen where the children got to see and hear first-hand how the maple sap becomes maple syrup. The smell alone was mouth-wateringly delicious. By then, everyone was ready for lunch. The good news is that lunch was ready for them as well! The food was incredible. The stars were the traditional sugar shack fare: pea soup, sliced ham, fluffy eggs, home-style breakfast potatoes, baked beans, coleslaw, pickled beets, pickles, bacon, pork rinds and of course, fresh rolls. Our halal and vegetarian friends were not left out, there was a scrumptious vegetable soup, root vegetable casserole and meat-free beans to fill their bellies. Then there was dessert … we all had pancakes with fresh maple syrup and an out-of-this-world treat called “grands-pères à l'érable.” A moist cake swimming in a sea of warm maple sugar sauce. With bellies filled to bursting, the children and staff made their way back to the main room to get dressed for the trip back to school. On their way out, a surprise was waiting … “tire!” Each one got a popsicle stick rolled into warm maple taffy. It was the perfect sweet ending to a Quebec tradition among the maples. Some outdoor activities with Dynamix. DYNAMIX IN WESTMOUNT: On April 14 and 17, the students at Westmount Park Elementary School, honed their team-work with the help of the awesome animators from Dynamix! They participated in events geared to encourage the development of team spirit, respect for others and problem-solving skills. Each event was packed with challenges that require children to work together through a series of high-energy, fun, and fast-paced games designed to teach valuable interpersonal skills. A good time was had by all! GAY STRAIGHT ALLIANCE: The groundbreaking Gay-Straight Alliance (GSA) club at Lester B. Pearson High School in Montreal North is getting ready to celebrate its first anniversary in mid-May. It will coincide with International Day against Homophobia (May 17). Opened in March 2014, the GSA was the first of its kind at the EMSB. Over the past year, it has successfully provided a platform for students to have a voice and promote diversity and awareness through education, support, social justice and advocacy. In honour of their first anniversary, the GSA will be unveiling a mural that has been painted on the club’s door. Open to students during lunch as well as after school, the GSA has become ingrained in the community at LBPHS, offering students an environment where they are valued, recognized and accepted. The GSA was developed by Natasha Krsteski, a guidance counsellor at the school, along with the school administration and a committee of 25 committed, passionate and brave students who believe in equality and who want to be part of a movement. EAST END EATS: Three EMSB schools (John Paul I, Laurier Macdonald, and Gerald McShane) are creating an intergenerational recipe book that will be launched at the “East End Eats!” evening. This intergenerational project is a multimedia, cross-curricular project designed to engage our students in writing, photography, and other activities as they researched the history behind their family’s photographs and artifacts. After writing about the family member of their choice, they will share a family recipe which will be placed in this book. The official launch of each book will take place on Wednesday, May 13 (6 p.m.) at Plaza Antique (6086 Rue Sherbrooke Est). The “East End Eats!” evening will be open to all participants of the books as well as extended community. If you would like to purchase tickets ($25 per person) for this event, please contact Vince Lacroce at vlacroce@emsb.qc.ca. If you would like to make a donation to the cause, please make the cheques payable to Laurier Macdonald High School (Memo: The Alzheimer Society of Montreal). All proceeds from the book sold will benefit The Alzheimer Society of Montreal (www.alzheimer.ca). The deadline to purchase will be May 6. Michael Bonacini, from MasterChef Canada along with Sergio Mattoscio from Top Chef Canada, Stefano Faita from CBC's In the Kitchen and Ashley Thornton from the Radio-Canada show called Les Chefs will be attending and judging the food for our event. Mose Persico from CTV Montreal’s will also be featuring this event. MONASTERY VISIT: On Monday April 20, Grade 5 students from Dante School in St. Léonard and Dalkeith Elementary in Anjou organized a visitation to the Monastery of the Virgin Mary Consolatory (Greek Orthodox Monastery). The program was spearheaded by Vince Lacroce and five teachers. The intent was to expose and educate the students as to the deep spiritual tradition of this religious community as well as the history of the Greek Community and the fantastic craftsmanship of the sisters’ of the Virgin Mary Consolatory. B.R.A.V.E: Since March 2005, Spiritual Community Involvement Animators Vince Lacroce and Rocco Speranza have been holding spring spiritual retreats at Laurier Macdonald High School in St. Léonard. The objectives of these retreats are to guide the students to find their inner-self, gain confidence, increase self-esteem, and sensitize them to the needs of their fellow students in their communities. In honour of the 10-year anniversary of these spring retreats, Mr. Lacroce and Mr. Speranza focused on Beliefs, Respect, Assertiveness, Valor, and Empathy (B.R.A.V.E.). The program was packed with games, exercises, meditation, and activities to help students with the transition from elementary to high school. Over the past 10 years, over 5,000 students have taken part in these retreats. WE DAY: Laurier Macdonald students Francesca Varrone, Alessia Colacci and Fabiana Lapolla got to take a photograph with inspirational Hollywood star Marlee Beth Matlin at We Day in Ottawa. She is the only deaf performer to win the Academy Award for Best Actress in a Leading Role, which she won for Children of a Lesser God. MICHELANGELO ANNIVERSARY: On Sunday, May 24 (May 31 in the event of inclement weather) Michelangelo International Elementary School in RDP will be celebrating its 25th anniversary. There will be an official ceremony in the morning in the school gym at 11 a.m. followed by many amusing activities and music provided outdoors. Students and alumni and their families are invited to come, as well as the entire community. 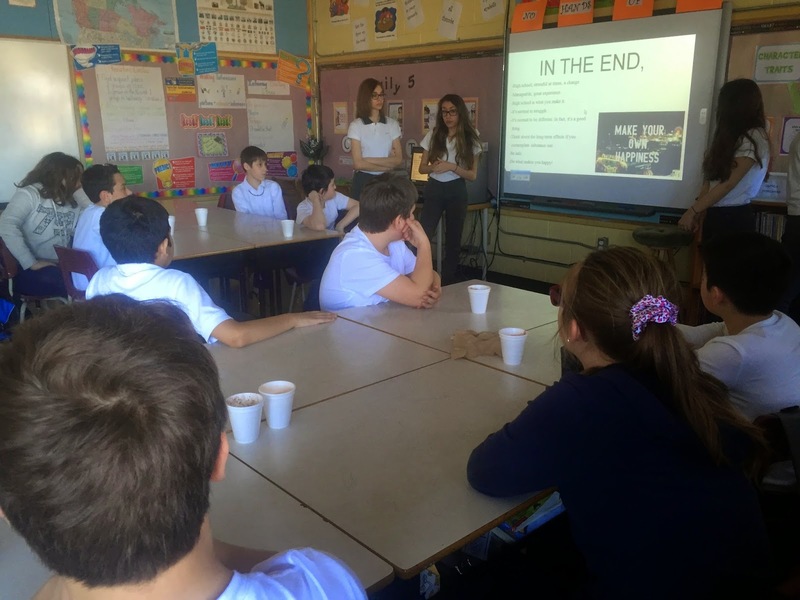 INSIGHT FOR THE FUTURE: On April 8, Secondary II students from John Paul I Junior High School along with Secondary III students from Laurier Macdonald High School presented workshops to Cycle III students at Pierre de Coubertin Elementary School. The INsight workshops focused on issues pertinent to the development of young teens and on the transition from elementary to high school. Issues that were covered in these workshops included mental health, bullying and substance abuse. Students prepared their own interactive PowerPoint presentations which included role playing and activities with the students. In joint collaboration, this project was spearheaded by Vince Lacroce and guidance counsellor Amanda Lambrinos. The workshops were also reviewed by Agent Pivot-Healthy Schools Consultant David-Roger Gagnon. 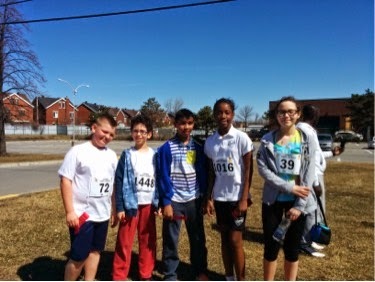 CEDARCREST RUN: At the beginning of April, the Cedarcrest Elementary School run club participated in their first race of the season at Les Courses St Laurent. Led by teachers Ms. Stephanei and Mme. Marylene, five students chose to take time out of their weekend to participate in a true racing experience during their one kilometre race, complete with large crowds cheering and roads blocked off for their safety. Students are looking forward to many more races under the shining sun! James Lyng students prepare to enter the Centaur to see the play. THE ENVELOPE: Students and staff from the EMSB’s James Lyng and FACE High Schools attended a matinee performance of Vittorio Rossi’s outstanding new production at the Centaur Theatre called The Envelope. Rossi is a James Lyng grad and encouraged students to attend when he visited the St. Henri campus in February. The Envelope, a comedy-drama anchored in the complex Canadian film industry, finished its run on April 19. The story began with excited actors gathering in a local Italian restaurant, with two producers jockeying for the film rights to a new play premiering at an Old Montreal theatre. Torn between an L.A. indie filmmaker and a local producer dangling a tempting multi-million dollar envelope from the Canadian Federal Film Fund, the playwright had to confront ambition over loyalty and money over art. Made in Canada movie projects generate more red tape than red carpet winners in this engaging new play about the celluloid dream factory. After the show, actors Ron Lea, David Gow, Tony Calabretta, Guido Cocomello, Shawn Campbell, Mélanie Sirois and Leni Parker engaged in a talk back with the students. CROSS CURRICULAR PROJECT: Secondary IV students at James Lyng are working on a cross curricular project which focuses on the history of the South West community. As a part of that project, students must photograph and interview past and present community members. It will culminate with a photo book featuring interviews, photos of historical landmarks, portraits, and creative writing pieces. There will also be a mural on the outside wall of the school using portraits of community members interviewed. Once completed, there will be a vernissage to close off the project, celebrate the youth’s works as well as to officially launch the school’s Urban Arts program. Concordia athletes played a helpful role. JUMP ROPE FOR HEART: Students, parents and staff at Royal Vale School in N.D.G. broke the $200,000 plateau in funds raised at the 12th annual Jump Rope for Heart. Organized annually by Physical Education specialist Norman Katz, the tradition has become a staple at the school, as the entire student body, from Kindergarten through Grade 11 participate as well as droves of parent volunteers help encourage the students, pass out healthy refreshments and even participate themselves. The school also organized a family activity, whereas parents could skip rope and enjoy the activity with their children. As in previous years, the event also draws local athletes. Encouraging students this year were a number of student athletes from the Concordia Stingers as well as members of the Montreal Alouettes. See the photo album. VIRTUAL CHOIR: Canadian Parents for French-Quebec, in partnership with Bishop’s University, the Community Learning Centres and the Quebec Federation of Home and School Associations, have spearheaded the first French-Second-Language Virtual Choir in the province. Fannie Gaudette, Director of the Bishop’s University Singers, created an original medley of well-loved Quebec classics which elementary school and community choirs from Anglophone communities and their Francophone counterparts throughout the province will learn. Chantal Gosselin travelled to these communities in January and February 2015 to work with the choirs on perfecting the song. The choirs were recorded singing and the individual videos were uploaded and edited into a single video, available for all to watch! The only EMSB school to take part was Cedarcrest Elementary in St. Laurent. Here is the link. If you are interested in learning more about the project, please contact Marla Williams at mwilliams.cpf.ca. ANOTHER MUSICAL SUCCESS STORY: A total of 340 Montreal elementary school choristers, a symphonic orchestra and renowned Quebec actor Guy Nadon have collaborated on a children’s book/CD about the ancient Greek myth of Persephone and how the seasons came to be. These students recently performed live at Royal Vale School in NDG on for an upcoming Radio Canada special on their groundbreaking project. All 340 choristers, accompanied by the orchestra were on hand. Le Temps des Fleurs, le Temps des Neiges is a massive multi-disciplinary project culminating in the creation of a book/CD for children in French which explores the ancient Greek myth of the Goddess Demeter, her daughter Persephone and the unbreakable bond that exists between a mother and her child. The EMSB is represented by six elementary schools: Gardenview in St. Laurent, Pierre de Coubertin in St. Léonard, Edinburgh in Montreal West, Roslyn in Westmount, Royal Vale in NDG and Sinclair Laird in Park Extension. The accompanying CD will feature a complete musical version of the book with performances by soloists and the combined choirs of 12 different schools Net profits from the sales will be donated to the participating schools. Le Temps des Fleurs, le Temps des Neiges will officially launch in November 2015, with presentations in the City Hall of Montreal, the Salon du Livre de Montréal as well as the Hellenic Community of Greater Montreal. Here is the report. ARTISAN MARKET FOR SPECIAL NEEDS: Montreal’s first ever special needs artisan market will take place on Friday, May 8 from 3 pm to 9 pm at Rekinexion (38 Rockland) in TMR, close to the L’Acadie metro. The mission of this exciting new venture is to expose and celebrate the amazing artistic talents of special needs people and encourage their integration into productive roles in our communities. Come out to mingle and view the beautiful artwork that these individuals have created. This is a perfect opportunity to buy an original and meaningful gift for Mother’s Day! Admission and parking are free. If you know of an artist with special needs who would like to exhibit their work, or if you would like to sponsor or participate in this event, contact creatabilityexpo@gmail.com or 514.342-3331. For information visit www.creatabilityexpo.com. ROSEMOUNT SCHOLARSHIP WINNERS: Three Rosemount High School students were recognized this month for their academic perseverance and achievement. Two of the students, Thy Bao Thai and Shabishan Sasitharan, each won a $1,000 scholarship from the Caisse Desjardins, which recognizes their perseverance, participation in school life, and academic achievement. The scholarships were presented at a ceremony on April 7. Both students will be attending Marianopolis College in the fall. Veronica Dhindsa was awarded a $500 scholarship for her academic perseverance from the non-profit organization Fonds 1804 pour la perseverance scolaire. Veronica will be officially recognized at a special Gala on May 2, in the presence of David Heurtel, Quebec’s Minister of Sustainable Development, the Environment and the Fight Against Climate Change. Veronica will be studying sciences at John Abbott College in the fall. ANNUAL ART SHOW: Everyone is invited to come and celebrate diversity! Rosemount High School is hosting its annual art show titled "Diverse City" on Friday April 24 (3 p.m. to 7 p.m.).The exhibit will feature artwork from Grades 7 to 11. The students have created masks, plasticine reliefs, paintings, plaster sculptures and collages. Visitors will be encouraged to vote in our photo contest to determine which images will receive the top prizes. There will also be a Rosemount High School first - a collective mural created by the RHS staff. The students have also created a scavenger hunt where participants search for clues found in the artworks. All are welcome. SOCCER SUCCESS IN DUBAI: Secondary I student Ryan Medeiros was in Dubai, UAE from March 30 to April 4 to take part in the 2015 Dubai International Super Cup soccer tournament for elite U13/U14 players from around the world. Ryan and his team returned to Canada as silver medalists, out of 14 elite teams. Ryan is currently a member of the U13 elite soccer program at the Académie Canadienne Prospective (ACP). Taking up soccer seriously at the age of 6, the young defensive player has previously traveled for tournaments in France and England. In addition to attending practices four times a week, Ryan, whose dream is to play professionally for Portugal, has been able to maintain his school work while playing both outdoor and indoor soccer this year for Rosemount High School. NATIONAL GOLF IN SCHOOLS: Golf is a sport that can be used as a vehicle to promote key values and life skills that transfer beyond golf into the real world, like focus, respect, sportsmanship, perseverance and honesty. Rosemount High School has joined the National Golf in Schools Program to deliver the game of golf, and the life skills that come with it, to our students. The program, whose partners and supporters include Physical & Health Education Canada, the PGA of Canada, and Golf Canada, is anticipated to start on May 1st. No golf experience or knowledge is necessary for students to participate. TEAM INSPIRATIONS: The 2015 Montreal Walk Now for Autism Speaks Canada will take place on Sunday, May 24 at McGill University Tomlinson Fieldhouse from 8:30 am to 11:45 am. Team Inspirations will be representing the EMSB, and we’re looking forward to walking the three km distance with a great group of concerned friends. Join our team by logging on here and click on the right side to join an existing team (look for Team Inspirations). Feel free to make a donation if you would like to support the cause. We look forward to seeing you there! For information contact wendyinspirations@gmail.com. BAND CAMP: A number of EMSB students have been travelling to Asbestos during the summer to attend a very successful band camp. Camp Musical d’Abestos (http://www.campmusicalinc.com) is located in Trois Lacs outside of Asbestos, in the Estrie region of southeastern Quebec on the Nicolet River. Bianca, Pipa and Willa Jones attended last summer and they all go to FACE. There were also several students from Rosemont High School, Vincent Massey Collegiate and Royal West Academy last year.Organizers say that two weeks of camp is equivalent to one year of music lessons and the students who attend become good anchors for their respective school music programs. All throughout the summer, many sessions are available to develop music skills. University and college level teachers share their knowledge and their secrets on their respective instruments. The sessions are for two, two week periods with a large concert at the end of camp. For more information go to the website or call 1-888-834-4342. Here is a video. Other activities will include an interactive quiz on Canadian and Quebec culture, performances from the winners of the Lester B. Pearson School Board SLAM contest, a francophone youth hip hop dance group, the presentation of web series produced by Marymount Academy International and a much anticipated interactive finale starring the always entertaining Ligue D’improvisation Montréalaise. The event will conclude with some exciting prizes presented by local sponsors. For more details, log on to www.french-future.org. HARLEM GLOBETROTTERS: Zeus McClurkin, a player from the world famous Harlem Globetrotters, visited with students at two EMSB elementary schools on March 30 to present “The ABCs of Bullying Prevention,” which targets six to 12 year-olds. The programs took place at Roslyn Elementary School in Westmount and Coronation Elementary School in Côte des Neiges. The Globetrotters, who played at the Bell Centre on April 10, designed the program in coordination with the National Campaign to Stop Violence (NCSV). It focuses on Action, Bravery, and Compassion, comprising the ABCs. The visits were a huge success. See this excellent CTV report as well as our own video. QUEBEC ROOTS: Along with students at Mackay Centre School, anglophone elementary and high school students from several schools across the province explored youth at risk themes in this year’s edition, such as marginality, homophobia, and bullying, through photography and writing workshops. They will take part in a book launch at Blue Metropolis on Friday, April 24 (10 a.m) at Hotel 10 (10 Sherbrooke Street West) at Salle Godin. BUILDING A GOOD FOUNDATION: Roslyn School Foundation hosted Concordia University students from Professor Amy Creighton's third year Communications course on March 24. The community event was held in the Roslyn School library and featured the students' group projects with recommendations on how the Foundation should celebrate its 10th anniversary event this fall. The evening saw seven groups present their proposals to the Foundation's Board of Directors and Roslyn School guests. In attendance from Roslyn School Foundation were Paul Tsang (President), Irma Alvarez (Vice President), Jennifer Timmons (Secretary), Mélanie Dinis-Fernandez, and Honourary Members Jasmin Uhthoff (Founding member and first President) as well as Roslyn School principal, Nicholas Katalifos. Special guests of the Foundation included Roslyn Governing Board Chair, Brian Weber and past Governing Board Chair and long standing supporter of Roslyn School, Christine Cardinal. Professor Creighton's students displayed great energy, enthusiasm and strategic thinking in their recommendations to the Foundation. First year President Paul Tsang commented, "For the majority of students, this project marks their first exposure to a not-for-profit business and the group quickly showed their understanding of the Foundation's challenges and opportunities. This project allowed the students to support our Foundation's efforts to generate awareness and fundraise on behalf of Roslyn. We hope the students stay in touch. We'll definitely invite them to help us celebrate our 10th Anniversary this fall!" Refreshments were graciously donated by Roslyn parents and friends of the Foundation. The Board of Directors wishes to Thank professor Creighton and her students for their efforts to help advance the mission of the Foundation and in turn the Board hopes through this project there are 30 plus new Roslyn School Foundation ambassadors. If your school wants to start a Glee Club, Farkas can be reached at kidsgroove@hotmail.com. Check him out as well at: https://soundcloud.com/farkasmick. TOONIE CHALLENGE: For the third straight year, Willingdon Elementary School in N.D.G. participated in the Toonie Challenge, an initiative spearheaded by the McGill University Health Centre (MUHC) Foundation. The goal of the Toonie Challenge is to collect enough toonies (69,000) to circle the entire Glen Campus. While collecting toonies, students learn about the needs of the hospital and foster a relationship with the MUHC. All of Kathleen Usher’s Grade 5 classes participated in the challenge. A team of 22 students led the way by making posters and giving Toonie Challenge presentations to their peers. Usher ran the challenge alongside their module on the human body. Unique to Willingdon, in lieu of a traditional Science Fair, students choose projects on the human body and present their research in fun and interactive workshops to Grade 1 students in May. In addition to helping the foundation, the reward for the class that raised the most toonies was a completely edible digestive system composed of fresh fruits and served with chocolate sauce. “Our students enjoyed the Toonie Challenge event,” said Usher. “They were able to participate in activities [sponsored by the MUHC] that they would not have otherwise had access to.” Eleven schools in all participated in this year’s Challenge. STUDENT LEADERSHIP RETREATS: For the next two months Cycle III students from several elementary schools and high schools in the East End (Dante, Dalkeith, East Hill, Edward Murphy School, General Vanier, John Paul I High, Laurier Macdonald High and Vincent Massey Collegiate) will take part in Spring Leadership Retreats animated by Spiritual Care, Community Involvement and Guidance Animators, Rocco Speranza, Vince Lacroce and Maria Kelly. The theme of the spring retreats is B.R.A.V.E. This acronym helps youth remember the main goals of the retreats; to instill bravery, positive body image, respect, assertiveness, virtues and values, excellence, empathy and encouragement. Retreats begin with a vision quest and end with an affirmation circle. The fun filled retreat days are designed to aid our students feel more comfortable and confident with the transition from elementary to high school, and from high school to college. The retreat program further works on team building and leadership skills. These retreats help answer questions about issues and concerns youth have about high school life. Motivational speaker Steven Atme attended some of the retreats and shared his inspiring story of achieving one`s goals and dreams. The organizers wish to extend a big thank-you to all the high school student leaders, teachers, and administration from all schools involved for helping these days happen; they are very beneficial for our students. DRAGON BOAT FUNDRAISER: The Missing Children’s Network has begun to plan its annual Dragon Boat Challenge along the Lachine Canal on June 7. This event is the organization’s single most important fundraiser of the year and brings together teams from all walks of life that include families of missing children, child care centers, partners of Our Missing Children program, as well as corporations strongly committed to making a real difference in their community. The event illustrates camaraderie, teamwork and inspiration and is a full day of friendly competition and festivities for the entire family. Organizers have thrown out a challenge to see if two teams from the EMSB would consider entering – specifically high school teams composed of students. Info: p.arcamone@enfant-retourquebec.ca. Here is a video. Here is a letter from Pino Arcamone directed to EMSB. STUDY ON WEIGHT LOSS: Farah Islam, a graduate of St. Dorothy Elementary School in St. Michel, wishes to reach out to the EMSB Community to help find individuals to participate in a project of the McGill Health Psychology Lab. Farah is currently a full-time student studying psychology at McGill. She works part-time in Dr. Barbel Knauper's Health Psychology Lab as a research assistant. Her duties include: data entry, literature reviews, and assisting groups for the healthy weight program. One of her colleagues is Virginia Rogers, whose father teaches at Rosemount Technology Centre. The Lab is presently looking for individuals to participate in their weight loss clinical trial. The aim of the study is to improve eating and exercise habits by teaching people how to develop new and lasting eating and exercise habits. This Healthy Weight Program will be delivered over one year and consists of 12 weekly core sessions, four transitional sessions over three months and six monthly support sessions offered at different time slots on varying days each week for convenience. The group size will be about 10 people and sessions will last approximately one hour. Trained lifestyle coaches will be leading the sessions, as well as providing guidance and support. The program is free for men and women aged 18 to 75 who are overweight or obese. Dr. Kuiper is particularly encouraging men to participate. Please call 514-398-1399 or email mcgillhealthyweight@gmail.com. ROSEMOUNT TECHNOLOGY CABINETMAKING: Cabinetmaking students at Rosemount Technology Centre (RTC) are putting their new skills to work helping the community this spring, by building two kitchens for Habitat for Humanity, a non-profit organization that helps house low-income families. Supervised by veteran instructor Alan Rogers, the students are involved in every step of production, from on-site measurements to the final tweak of a screw to adjust the cabinet doors. Six months ago many of them had never used power tools. The build comes halfway into the 14 month professional training. Students have already built many smaller projects including boxes, solid wood cabinetry, and tables. RTC Cabinetmaking began the collaboration with Habitat in 2013 with the construction of two kitchens for a duplex in the east end of Montreal. The project was a success with students and “we would love to make it a tradition – it’s a great example of collaboration between community, education, and industry,” says instructor Eliane Kinsley, who initiated the project.Construction in the school workshop began on March 31 and concluded April 15. Installation in the St Henri duplex will be done later in the month of April. Listen to this interview on CBC Radio Home Run. You can also see this photo album of the final product. HSM TEACHER HIGHLIGHTED: The Montreal Gazette recently filed an interesting story about High School of Montreal Adult Education Centre teacher Daniel Isaiah. In the Mile End apartment he has called home these last eight years, Isaiah keeps a space devoted to music and another to writing. The Montreal West native, who spent the bulk of his formative years at Jewish schools in neighbouring Côte St-Luc, can likely be found at his work desk in the spacious and tidy living room during business hours. It’s where he plies his more time-consuming trade: script-writing. Across the kitchen lies a more cramped and cluttered room boasting an unobstructed view of Mount Royal. In this inspiring setting, Isaiah wrote his second solo album, Come Into Gone, with a guitar and a small piano made with less keys than the norm. In 2014, Isaiah directed and co-wrote the short film, Entre chien et loup, under his full name, Daniel Isaiah Schachter. Right now, he’s in laid-back talk-singing songwriter mode, although the next movie project could be just around the corner. After years in bands, Isaiah made his solo debut with the album High Twilight in 2011. He didn’t feel the pressure to follow it up in a timely manner. Come Into Gone was released earlier this month. See the full Gazette story. ÉCONOMIES D’ÉNERGIE: Les écoles primaires et secondaires de la CSEM soulignent la semaine du Jour de la Terre (20 au 24 avril) de diverses façons, incluant la participation à une programmation spéciale reliée à l’efficacité énergétique. Le programme d’une heure sur l'efficacité énergétique est organisé par Jour de la Terre Québec et Énergère, une société de services énergétiques de premier plan au Québec. Le programme vise les élèves de la 5e à la 7e année et leur démontrera, par le biais d’une présentation animée PowerPoint et de plusieurs démonstrations interactives ce que signifie l’énergie ainsi que les divers moyens de pratiquer l’efficacité énergétique. Les écoles participantes sont : l’école secondaire John F. Kennedy de Saint-Michel; Michelangelo International de Rivière-des-Prairies; l’école Roslyn de Westmount; l’école Dante de Saint-Léonard et l’école secondaire Rosemont. LE PROJET: Un rappel que 17 écoles et centres de la CSEM participent à une initiative majeure de 24,6 millions $ visant à rehausser l’efficacité énergétique des bâtiments d’école. Ce nouveau projet avec Énergère, qui a été officiellement annoncé le mois dernier, inclut, entre autres mesures, le renouvellement et la modernisation d’équipement utilisant la technologie aérothermique, le remplacement de 25 300 ampoules électriques et l’ajout de contrôles automatisés pour rehausser le confort du personnel et des élèves. Dès que le projet sera complété, les 17 bâtiments atteindront une réduction de 53 pour cent de consommation d’énergie et une réduction de 74 pour cent d’émissions de gaz à effet de serre par an. ANGELIQUE FALBO: La CSEM est très fière d’Angelike Falbo, élève du secondaire V de l’école secondaire Laurier Macdonald. Elle a atteint les finales du spectacle populaire de la télévision francophone La Voix qui est suivi par plus de 2,5 millions de personnes chaque semaine. Angelike a fréquenté la CSEM depuis qu’elle a joint le réseau d’éducation publique, premièrement à l’école primaire Frederick Banting, ensuite à l’école secondaire du 1 er cycle John Paul I et maintenant à Laurier Macdonald. Son père, Joe Falbo, est un canado-italien et sa mère Manon Ledoux est francophone. M. Falbo crédite l’excellent enseignement du français de la CSEM pour le bilinguisme d’Angelike. Son impeccable maîtrise du français est régulièrement mise en vedette au cours des entrevues, sur scène et certainement par la chanson. Video ici. Une des autres quatre finalistes a été Rosa Laricchiuta, diplômée de l’école secondaire Lester B. Pearson de Montréal-Nord. MOIS DE SENSIBILISATION À L’AUTISME: En reconnaissance du Mois de sensibilisation à l’autisme, les élèves, le personnel et les parents de l’école primaire Edward Murphy d’Hochelaga Maisonneuve ont organisé récemment une marche pour répandre la sensibilisation à l’autisme et appuyer leurs camarades atteints d’autisme. Les élèves d’Edward Murphy ont beaucoup appris au sujet de l’autisme au cours des dernières semaines. Edward a deux classes spécialisées pour les élèves avec autisme. Guidé par la directrice Franca Cristiano, le personnel offre aux élèves des occasions de mieux se connaître et de jouer ensemble. Il intègre les élèves autistes aux classes régulières et constate un très grand progrès. En préparation au Mois de sensibilisation à l’autisme, Tania Piperni, conseillère en troubles du spectre autistique de la CSEM, a présenté des ateliers sur l’autisme à chaque cycle donnant aux élèves l’occasion de poser des questions et de mieux le comprendre. Stéphanie Napolitano et Pamela D’Adamo enseignent aux deux classes de l’école pour élèves autistes et ont organisé la marche de sensibilisation à l’autisme, à laquelle tous les élèves, enseignants et quelques parents ont participé. Voir communiqué de presse. Entre temps, le personnel de l’école primaire Carlyle de VMR a porté du bleu au travail le 2 avril pour souligner la Journée de sensibilisation à l’autisme. Il a répondu à une invitation lancée par leurs collègues de l’école Giant Steps. VISITE À PEARSON: Le programme couronné de succès CSEM-Impact intitulé (Jusqu’au bout avec l’Impact), conçu pour promouvoir l’importance de la persévérance scolaire, se poursuit pour une 10e année consécutive. Le lancement officiel a eu lieu le 31 mars à l’école secondaire Lester B. Pearson de Montréal-Nord, qui offre le seul programme Sport-Études à la CSEM et a aussi un partenariat avec l’Académie Impact. Actuellement, neuf élèves du programme Sports-Études jouent pour l’Académie Impact. Des invités spéciaux au lancement incluaient des membres de l’Impact de Montréal et de l’Académie : le gardien de but, Evan Bush, le joueur de milieu de terrain et élève de l’école secondaire Lester B. Pearson et membre de l’Académie Tristano Fasulo ainsi que l’ancien joueur de l’Impact et actuellement entraîneur-chef de l’équipe U18 de l’Académie, Jason Di Tullio. CONCOURS D’ART ORATOIRE: Le concours 2015 d’art oratoire de la Commission scolaire English-Montréal pour les élèves du secondaire a eu lieu le 17 avril à l’école secondaire Rosemont. Comme par les années passées, le Club Rotary a invité le lauréat du secondaire V à participer à son concours en mai. En outre, le Cercle canadien des femmes a offert au lauréat du secondaire IV une semaine, tous frais payés, à Rencontres avec le Canada à Ottawa. Les finales d’école pour choisir leurs représentants ont eu lieu en mars et au début d’avril. Le format requis pour les élèves du secondaire I et II était la présentation d’un texte qui relatait une histoire personnelle, telle que la vie en famille ou un incident autobiographique. Les élèves du secondaire III, IV et V ont fait des discours persuasifs sur des sujets d’importance sociale et globale. SAUTONS EN COEUR: Les élèves, les parents et le personnel de l’école Royal Vale de NDG ont dépassé le plateau de 200 000 $ en fonds levés au 12e « Sautons en cœur » annuel. Organisé annuellement par le spécialiste en éducation physique, Norman Katz, la tradition est ancrée à l’école et tout l’effectif scolaire de la maternelle à la 11e année participe ainsi qu’un grand nombre de parents bénévoles qui encouragent les élèves, distribuent des rafraîchissements sains. L’école a aussi organisé une activité familiale où les parents pouvaient sauter à la corde avec leurs enfants. Comme par les années passées, l’évènement a aussi attiré des athlètes locaux dont plusieurs élèves–athlètes des Concordia Stingers, ainsi que des membres des Alouettes de Montréal. D’autres écoles sont encouragées à participer au programme annuel de « Sautons en Cœur » offert aux écoles primaires de Montréal. Appuyant la santé des enfants depuis plus de 30 ans, la FondationMC des maladies du cœur, encourage les enfants à être actifs en sautant à la corde tout en recueillant des promesses de dons pour la recherche sur les maladies du cœur. Le programme donne l’occasion aux enfants de sauter et de jouer en même temps que 750 000 autres enfants dans plus de 4 000 écoles à travers le Canada. Au cours des années, l’école Royal Vale de NDG, guidée par l’enseignant d’éducation physique, Norman Katz, a organisé plusieurs évènements couronnés de succès. Voici une affiche qui décrit le programme -- http://www.emsb.qc.ca/emsb_en/pdf_en/media_en/flyer/2014-09-04-Jump_online.pdf. Voici un lien à leur nouvelle vidéo : https://www.youtube.com/watch?v=AaSXGrXnUO4. Pour plus de renseignements, communiquer avec Jessica Liberatore au 514-871-8038, poste 240 ou par courriel à jessica.liberatore@fmcoeur.qc.ca et se connecter à fmcoeur.ca ou heartandstroke.ca. MARCHÉ ARTISANAL POUR BESOINS PARTICULIERS: Le premier marché artisanal pour besoins particuliers aura lieu le vendredi 8 mai de 15 h à 21 h au Rekinexion (38 Rockland) VMR, près du métro l’Acadie. La mission de cette excitante nouvelle initiative est d’exposer et de célébrer les incroyables talents artistiques des personnes aux besoins particuliers et d’encourager leur intégration à des rôles productifs dans nos communautés. Ceci est une parfaite occasion d’acheter un cadeau original et significatif pour la Fête des Mères! L’entrée et le stationnement sont gratuits. Si vous connaissez un artiste aux besoins particuliers qui voudrait exposer son travail, ou si vous voulez commanditer ou participer à cet évènement, contactez creatabilityexpo@gmail.com ou téléphonez au 514-342-3331. Pour plus de renseignements, visitez www.creatabilityexpo.com. HARLEM GLOBETROTTERS: Zeus McClurkin, un joueur des Harlem Globetrotters de renommée mondiale, a visité deux écoles primaires de la CSEM le 30 mars pour présenter « l’ABC de la prévention de l’intimidation » qui vise les élèves de 6 à douze ans. Le programme a eu lieu à l’école primaire Roslyn de Westmount et l’école primaire Coronation de Côte-des-Neiges. Les Globetrotters qui ont joué au Centre Bell le 10 avril ont conçu le programme en collaboration avec la campagne nationale Stop Violence (NCSV). La campagne est axée sur l’Action, la Bravoure et la Compassion qui forment l’ABC. Les visites ont remporté un très grand succès. BÂTIR UNE BONNE FONDATION: La Fondation de l’école Roslyn a reçu, le 24 mars dernier, les élèves de troisième année du cours de communication du professeur Amy Creighton. L’évènement communautaire s’est tenu à la bibliothèque de l’école Roslyn et a souligné les projets de groupe des élèves avec des recommandations sur la façon dont la Fondation devrait célébrer son 10e anniversaire cet automne. Sept groupes ont présenté leurs propositions du conseil d’administration de la Fondation et aux invités de l’école Roslyn. La Fondation était représentée par : Paul Tsang (président), Irma Alvarez (vice-présidente), Jennifer Timmons (secrétaire) Mélanie Dinis-Fernandez et Jasmin Uhthoff (membre fondatrice et première présidente) ainsi que le directeur de l’école Roslyn, Nicholas Katalifos. Les invités spéciaux de la Fondation incluaient le président du conseil d’établissement de Roslyn, Brian Weber, et l’ancienne présidente du conseil d’établissement et partisane de longue date de l’école Roslyn, Christine Cardinal. Les élèves du professeur Creighton ont fait preuve d’une grande énergie, d’enthousiasme et de raisonnement stratégique dans leurs recommandations à la Fondation. Le président, Paul Tsang a déclaré « Pour la majorité des élèves, ce projet marque leur premier abord à une entreprise à but non lucratif et le groupe a rapidement démontré sa compréhension des défis de la Fondation. Ce projet a permis aux élèves d’appuyer les efforts de la Fondation de générer de la sensibilisation et de lever des fonds pour l’école. Nous espérons que les élèves maintiendront le contact. Nous allons définitivement les inviter à célébrer notre 10e anniversaire cet automne! » Des rafraîchissements ont été gracieusement offerts par des parents de Roslyn et des amis de la Fondation. Le conseil d’administration désire remercier le professeur Creighton et ses élèves pour leurs efforts visant à faire avancer la Fondation et, à son tour, la Commission espère que par le biais de ce projet, il y ait plus de 30 nouveaux ambassadeurs de la Fondation de l’école Roslyn. DÉFI TOONIE: Pour la troisième année consécutive, l’école primaire Willingdon de NDG a participé au Défi Toonie (pièce de deux dollars), une initiative lancée par la Fondation du Centre universitaire de santé McGill. L’objectif du Défi Toonie est de recueillir suffisamment de pièces de deux dollars (69 000) pour encercler tout le campus Glen. Tout en recueillant les pièces de monnaie, les élèves se renseignent au sujet des besoins de l’hôpital. Onze écoles ont participé au Défi. ENSEIGNANT EN VEDETTE: La Gazette de Montréal a récemment publié un article intéressant au sujet de Daniel Isaiah, enseignant au Centre d’éducation des adultes du High School of Montreal. Dans l’appartement du Mile End qu’il occupe depuis les dernières huit années, Isaiah réserve un espace à la musique et un autre à l’écriture. Originaire de Montréal-Ouest, il a passé la majorité de ses années de formation dans des écoles juives de Côte Saint-Luc, on peut probablement le trouver à sa table de travail où il consacre la majorité de son temps à rédiger des scénarios. En face de la cuisine se trouve une chambre encombrée avec une vue dégagée du Mont-Royal. C’est dans cet environnement inspirant qu’Isaiah a composé son second album solo « Come into Gone » avec une guitare et un petit piano et moins de clés que d’habitude. Après plusieurs années avec des orchestres, Isaiah a débuté en solo avec son album High Twilight en 2011. Il n’a pas ressenti la pression d’en publier un autre immédiatement. « Come into Gone » a été publié au début de ce mois. 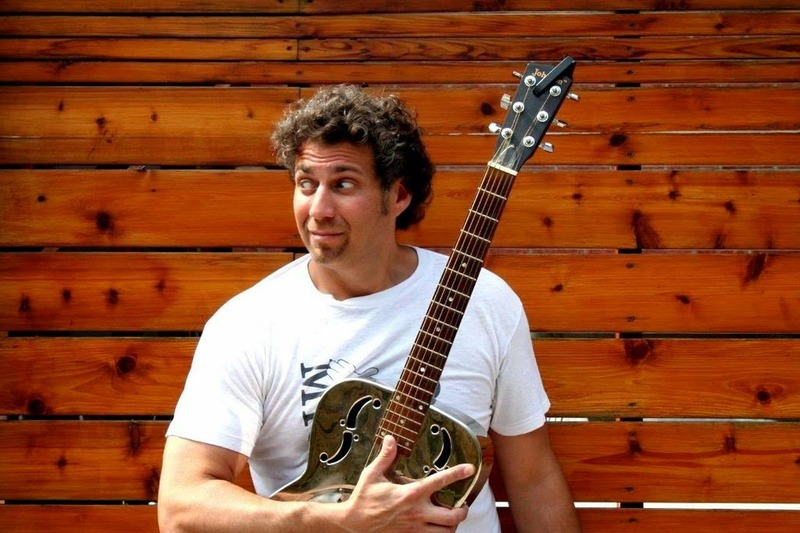 Voir l’article entier de la Gazette - http://montrealgazette.com/entertainment/music/daniel-isaiahs-tale-of-two-rooms. The next Focus will be published on May 28, 2015. Submissions should be made to Michael J. Cohen preferably by e-mail (mcohen@emsb.qc.ca) by Friday, May 22.